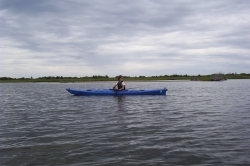 Experienced kayakers can access the beach and bay from numerous places in the park. Kayaking events are also held during the summer where you can learn basic kayaking, learn how to fish from a kayak, or simply go on a tour with others to see some of the natural areas around the park. Kayaks are available for some of the events, age and footwear restrictions may be required for your safety, and there may be fees charged to cover some of costs. Call the park nature center (732-793-1698) for more information. You do not need a permit to kayak but you are usually required to register for the kayaking events. Bay boat launching access for putting in a kayak or a canoe is available from parking areas A-15 and A-21. The photo was taken by Andy Szymczak.